Canadian dermatologists have had one more therapeutic option available for use in their Rosacea patients, following approval last summer of azelaic acid 15%. “It seems to be working well,” says Dr. Lyn Guenther, a professor in the depart ment of medicine at the University of Western Ontario and a dermatologist in private practice in London, Ont. “There is not one therapy that works in 100 per cent of patients 100 per cent of the time. For some people, a treatment like metronidazole may not be sufficient. It is nice to have another option.” Dr. Guenther notes some patients are very loath to taking oral antibiotics and want to try all possible topical agents before resorting to oral antibiotics. Azelaic acid gel (15%), is a topical therapy designed to address the inflammatory papules, pustules and flushing or redness that characterizes papulopustular rosacea. Two randomized, placebo-controlled trails of the azelaic acid gel conducted in the U.S. demonstrated a reduction in redness and swelling in rosacea patients and demonstrated that the topical therapy was well-tolerated. Finacea can be used as monotherapy to treat the papulaes, pustules, and redness associated with rosacea or it can be used in combination with therapies such as metronidazole, which is available as a gel or cream, according to Dr. Guenther. Patients with rosacea typically have sensitive skin, and it is recommended that they use mild skin cleansers that do not sting, adds Dr. Guenther. There are about two million Canadians living with rosacea, with the disorder being more prevalent among Caucasian woman aged 30- 50 years. It typically affects those affected with fair skin. One of the keys to preventing rosacea flares or exacerbating rosacea symptoms is to avoid the numerous recognized triggers such as spicy foods, alcohol, wind, sun, and strenuous activity, but patients can’t insulate themselves from all the triggers all the time, notes Dr. Lisa Kellett, a Toronto dermatologist and medical director at DLK on Avenue. “People have to be reasonable,” says Dr. Kellett. “You have to live. You just have to use your judgement. Don’t have a glass of wine before you are having your picture taken, but rather have a glass of wine after your picture is taken.” While rosacea is a chronic condition and represents a spectrum of disease, Dr. Kellett notes it can be treated. “It cannot be cured but it can be controlled,” says Dr. Kellett, who advises that topical treatments represent first-line therapy and that physicians then seek oral antibiotics like minocycline, tetracycline, and doxycycline if patients do not see satisfying results with topical treatments. “You really do need maintenance treatment whether you are using topical antibiotics, or a laser.” Light therapies, such as intense pulsed light, and lasers, such as the pulse-dye laser are used to treat the telangiectasia, erythema, and visible blood vessels that are present in patients with rosacea, says Dr. Kellett. Pulse-dye laser treatments can be more aggressive or less aggressive depending on the practitioner, notes Dr. Chris Keeling, a dermatologist in Edmonton and clinical associate at the University of Alberta. Patients may return for as many as 10 treatments if they want to rid themselves of almost every visible vessel, but some may be satisfied with the results after a couple of treatments. A series of pulsed-dye laser treatments will keep the blood vessels away for about four years, says Dr. Keeling. It is recommended that patients under go one or two pulsed-dye laser treatments per year as maintenance therapy. One of the potential limitations of azelaic acid 15% is that it can increase facial hairs, warns Dr. Mark Lupin, a dermatologist in Victoria, director and founder of Cosmedica Laser Center, a clinical instructor in the department of dermatology in the faculty of medicine at the University of British Columbia, and a fellow of the American Society of Laser Medicine and Surgery. “That [possible side effect] may be a concern for woman,” say Dr. Lupin. Ocular rosacea occurs in up to 50 per cent of rosacea patients, and some patients may not be aware that their eyes are affected, stresses Dr. Lupin. “Patients may not know it,” says Dr. Lupin. 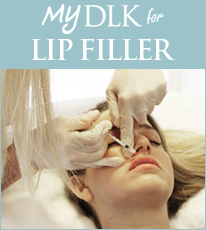 “You may wake up with dry eyes and not think of it as a skin condition. If they present with minor symptoms, a topical ophthalmic lubricant should treat it.” If an ophthalmic lubricant is appropriate, Dr. Lupin refers patients with ocular rosacea to an ophthalmologist for treatment, but more severe ocular rosacea may be better treated with oral therapies. Some oral agents such as doxycycline are more photo-sensitive than other agents, and are not a judicious treatment choice in the summer months for rosacea patients, says Dr. Lupin. In addition, IPL should not be applied to treat rosacea symptoms when patients are tanned, noted Dr. Lupin. 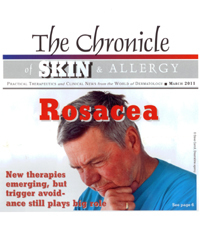 Sulfa drugs are also part of the pool of therapies that can used to treat rosacea, but clinicians need to be aware that patients may have a sulfa allergy, which excludes them as candidates for sulfa drugs. Flushing and redness can also be alleviated with newer anti-oxidant products, notes Dr. Lupin. “They are designed to strengthen the collagen, and they do seem to help with diminishing the blood vessels,” says Dr. Lupin. Other therapies such as epidermal growth factor inhibitors, designed to treat particular cancers, can also worsen rosacea symptoms, adds Dr. Guenther. Rosacea may be induced by steroid use, and therapies such as tacrolimus and pimecrolimus can be effective in those instances, Dr. Guenther added in conclusion.